Advantech's electronic eNewsletter and RSS feeds provide you the newest information of Advantech, from product news and updates to the latest events. Subscribe to the eNewsletter and RSS feeds to make the first-hand news delivered right to you. Please log in to edit/change your subscription preferences. 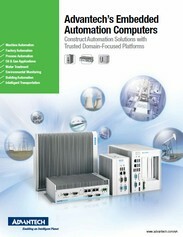 If you are NOT MyAdvantech members yet, please register. Please select one or more of the eNewsletter and RSS feeds below based on your needs . Highlights of the best industrial automation products, as well as details of certified products and integrated solutions for vertical markets. Features exciting new medical computing platforms and successful application stories covering the Medical Computing domain. Covers transportation and traffic management applications, including road infrastructure, railways and rolling stock, and more. Highlights innovative products and integrated system solutions for fleet management, in-vehicle surveillance, warehousing and ports. Latest product information about applications in retail and hospitality as well as many other diverse markets. Embedded technologies and solutions covering embedded boards, systems and peripheral modules, as well as software services for developers. Features innovative gaming platforms, software and peripherals, as well as up-to-date technologies for the gaming industry. Focuses on the latest solutions, and product and event information in the field of networks & telecom. Vertical-market eNews with latest news collection related to environment monitoring applications. Top news about Industry 4.0 trends, up-to-date technologies, and its impact to the world. Subscribe to Advantech's RSS (Really Simple Syndication) feeds to get news delivered directly to your desktop!